The Architect@Work show comes to Barcelona this March. A leading event for creatives, interior designers and architects, Architect@Work is a showcase for all the latest trends, developments and innovations in this sector. This is the first time Architect@Work has been held in Spain. Previous host countries include Belgium, Luxembourg, France, Austria, the UK, Italy, Sweden and Denmark. What makes Architect@Work different from similar events is that every exhibit on show is new, previously evaluated and approved by an independent panel of architects and interior designers. And there are no fewer than 450 new exhibits on display this year! 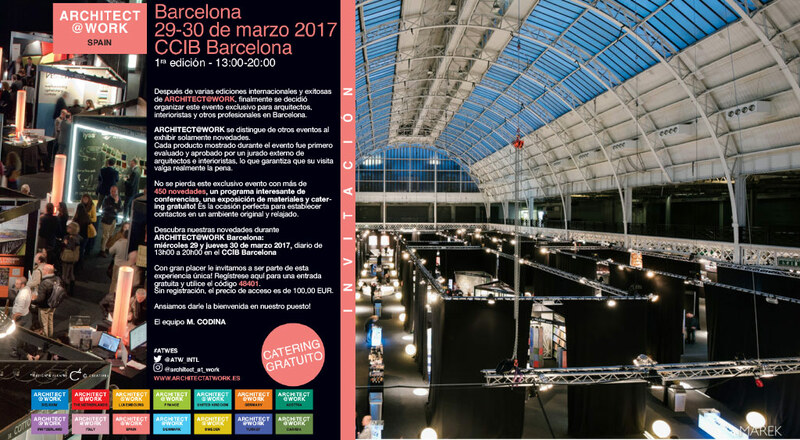 Codina has participated in earlier editions of the show around Europe and will be present in Barcelona with 3 new architectural mesh products. We’ll be at this exclusive event on 29 and 30 March in Barcelona, one of the world’s most beautiful, cosmopolitan and culturally and architecturally diverse cities. Come and see our new products at Architect@Work Barcelona—our stand will be open from 1 to 8 pm at the CCIB Barcelona exhibition centre.